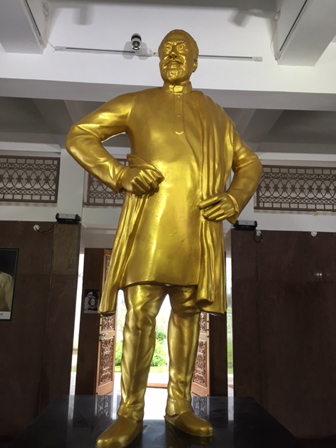 The Sivaji Ganesan Memorial in Adyar. The relocated Sivaji Ganesan memorial in Adyar and the controversy surrounding it highlight the need for an objective and impartial policy on memorials, their type, scale and location. After the High Court said it was a traffic hazard and blocked the view of traffic on the Beach Road, the statue was removed to a location near the Adyar Bridge. 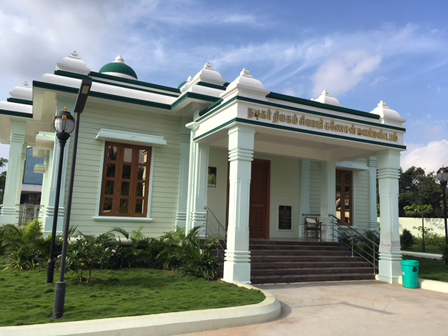 It is now housed in a mandapam-style structure costing Rs. 2.8a crore and taking up 28,400 square feet, equivalent to nearly 12 grounds of land space. The building is in the Dravidian style of architecture, adorned with domes. The memorial consists of a central hall and surrounding corridor, all measuring 2,500 square feet or so. On visiting it, you wonder if it should have taken as much as Rs. 2.8 crore for building a hall of this size. Hung on the surrounding corridor walls are photographs featuring Sivaji Ganesan with well-known personages of his time. To go around the hall and view the pictures, it takes hardly ten minutes, as there is nothing else of interest relating the exhibits to the memory of the great actor who thrilled millions by his unique style of acting and delivery of powerful lines. His stentorian voice, famous dialogues, exhibits of awards, specimens of dresses in famous roles such as, say, Kattabomman or Karnan, would have enhanced spectator value; if necessary, a small auditorium could have been added where visitors could press a button to choose a film scene that they want to recall. No wonder there are very few visitors. Overall, it is a dull affair. Spending so much of the taxpayer’s money and using up valuable land space, it is an expensive apology for a memorial. A statue in the middle of one of the busy squares of the City would have served the purpose, much better reminding us of Sivaji and his contributions. Apart from the fact that little thought seems to have gone into designing a memorial, a larger issue is whether there should not be a set of norms for the creation of memorials for personalities in different fields and of varying stature. For instance, what about a similar memorial for, say, N.S. Krishnan, the famous comedian of Chaplinesque calibre? What about famous musicians and sports persons? And, so on, in various fields. Feasibility of erecting mandapams for every one of these, occupying prime land in an already crowded city, is itself highly questionable. Memorials should not be intrusive and, preferably, not take up prime land. Where a special structure is to be created, it should add to a public facility at the same time – a library or park or hospital, for instance. An example is of memorials in the United States in the form of libraries and museums, to honour past Presidents and perpetuate their legacies. Only in exceptional cases of high historical significance do memorials have an exclusive physical element built, such as the Washington, Lincoln and Jefferson monuments. Most memorials have a living element of high public usage value, an example of which is the Woodrow Wilson International Center for Scholars. It has a small exhibit on President Wilson’s life and work, but is best known “for its work to unite the world of ideas with the world of policy”, providing facilities “for scholarship linked to issues of contemporary importance”. Similarly, the Harry S. Truman Scholarship honours U.S. college students dedicated to public service and policy leadership. The John F. Kennedy Center for the Performing Arts has on-going live theatrical performances. Other ways of commemoration promote public interest, as for instance the Adams National Historical Park. To avoid using up space and money without contributing to public purpose, it is advisable to name existing highways, roads, squares, airports, adding a statue in a prominent location at these sites, instead of going for exclusive memorial structures and complexes. Now that airline connections are being extended to regional centres at district levels, there is enough scope to name these airports after public figures and accommodate the growing demand for memorials. In cases of national or historical importance, a higher class of memorial could take the form of specially created public facilities like libraries, research facilities, auditoria and museums. A well thought out policy, setting out the norms for conferring the honour and the type of commemoration to express it, are necessary to avoid unseemly controversies and to ensure that resources are used to serve public purpose while honouring the meritorious.